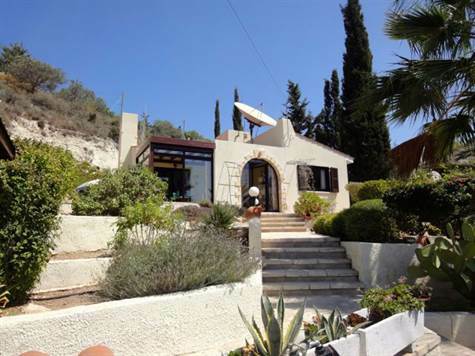 Cyprus Property Blog by Cleo : Absolute BARGAIN - Kamares Bungalow - Price Reduced. Owner must sell ASAP! Bargain Price & Fully Furnished! Kamares, Paphos - This charming bungalow is located in the popular award winning resort of Kamares, with its spectacular views and sunsets. The Kamares Clubhouse is nearby providing a variety of facilities such as restaurant, bar, mini-market, tennis courts, and a new medical centre. It is a popular venue for many local events. Paphos Town and the International School are a 10 minute drive away. An attractive archway frames the entrance to the property which leads through to a light and airy sun room with patio doors providing easy access to both the living room and the pool terrace. The L shaped living room has real character including wooden beamed ceilings and feature fireplace with fitted gas fire. It is nicely arranged with a comfortable lounge, dining area and study space. Off the dining area is a breakfast bar and elegant arch to a spacious and well equipped kitchen. A clever feature includes a fold away worktop built into the breakfast bar when additional worktop space is required. A shaded patio area at the rear of the property can be accessed directly from here. Accessed from both the kitchen and living room is a hallway leading to the master bedroom with en-suite shower room, a second double bedroom and a family size bathroom. There is plenty of storage space with fitted wardrobes in both bedrooms, additional storage cupboards in the second bedroom and a loft space also. To the side of the property is a crazy paved terrace ideal for relaxing by the solar heated swimming pool with built-in jacuzzi. The gardens are private, beautifully landscaped and easy to maintain. A large covered car port and open driveway caters easily for parking for 2 cars. Recently reduced from 265,000 for a quick sale this property represents exceptional value for money. It has full title deeds.